This IBM® Redbooks® publication brings together subject matter experts with experience using the leading IBM customer interaction platform for cross-channel and online commerce, IBM WebSphere® Commerce, with the powerful IBM Sterling Order Management, which coordinates order fulfillment from all channels and across the extended enterprise. An integrated solution was built in the lab that illustrates how these products can be integrated to benefit IBM customers. This publication focuses on the integration of the IBM high-volume commerce solution designed to address enterprise commerce needs by delivering a rich, robust multi-channel customer experience, with Sterling Order Management, designed to enable supplier collaboration with management and order fulfillment process optimization. 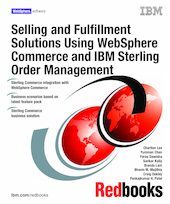 By integrating WebSphere Commerce and Sterling Order Management with out-of-the-box components, we prove that customers are provided an end-to-end solution to address a complete opportunity for a fulfillment life cycle that is cost effective and easy to implement. This publication targets a technical audience for the documentation of the integration approach by explaining the solution architecture and the implementation details. However, this publication also contains introductory chapters that contain executive summary material and provides well-documented scenarios with use cases for business analysts whose domain would be these systems.